You have to try my version of a Sticky Roast Ham! My Jack Daniels and Coke Ham is to die for! It makes it moist, succulent and so moreish you won’t be able to stop yourself! This started out as Nigella’s famous Coca Cola recipe, but as usual I couldn’t help myself and adapted the recipe for myself. So I thank Nigella for the inspiration! I serve this with homemade crinkle cut chips – always has to be crinkle … buy it here: …Crinkle Cutter and some good old Piccalilli and some beautiful Crinkle Cut Beetroot from Marks & Spencers. The difference between Nigella and I are some of the ingredients and the end flavour. Although I do use Coca cola I add a few other ingredients to give it a deeper flavour! Try it and see! 2. Halve the leek and place in a casserole/large pan and place the ham skinside down on top of the leeks. 13. Whilst it is cooking be sure to baste it frequently to ensure the sticky sauce is being used to it’s full potential! 15. 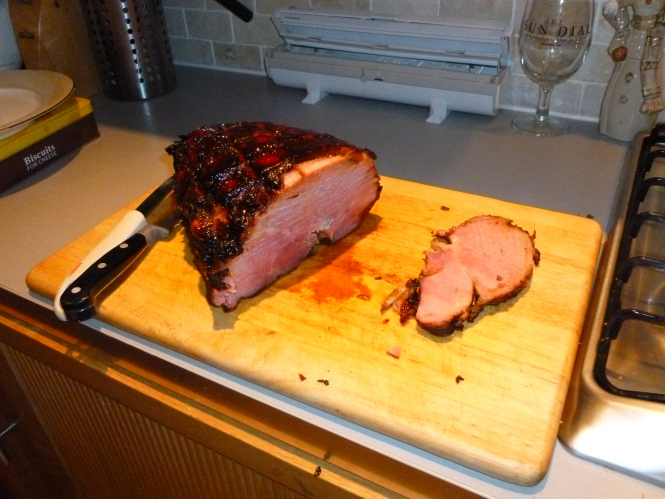 Once the ham is cooked, leave to rest for 10 mins, and carve with a sharp knife…. hmmmm yum! enjoy!